Canadian cuisine, which varies widely by region and its peoples. This cuisine combines the customs and traditions of the first three peoples’ kitchens of Canada, which are rooted in English, Scottish and French, and these provincial kitchens expanded after the subsequent waves of immigrants in the 19th and 20th centuries. From Central, Eastern, Southern, South Asia, East Asia and the Caribbean. Despite the ability to identify some of the dishes as Canadian depending on the ingredients used, or the area, it is difficult to define a complete style of Canadian cuisine. One Canadian official once said that Canadian cuisine is a kitchen and that it is a university of dishes from other cultures’ kitchens. 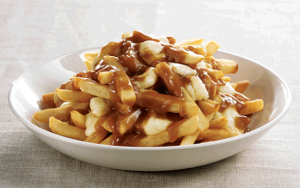 Poutine: Is a popular and very famous dish, first appeared in Quebec in 1950, consists of fingers of fried potatoes, cheddar cheese, sauce and chicken or beef broth, and the biotin eat low-cost high-calorie. 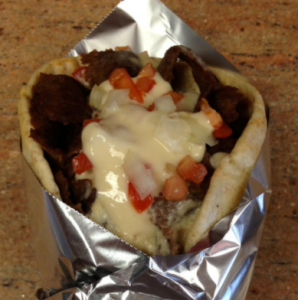 Nova Scotia Donair: It is sometimes called Maritime donair or Halifax donair. It is a famous snack or snack, including hot beef in French bread, topped with tomatoes, onions, sweet milk sauce, garlic powder, sugar and vinegar. 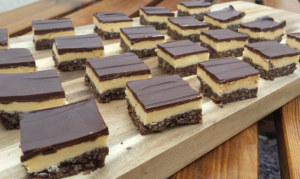 Nanaimo Bars: It consists of a wafer crumb-based layer topped by a layer of custardflavoured butter icing which is covered with melted chocolate made from chocolate squares. Lobster Roll: Meat mixed with mayonnaise, served in hotdog sandwich toaster.